Developing single adults to hear God's voice through the study of His Word and build healthy relationships in a like-minded community. Quest Small Groups is a bible-study focused small group ministry, open to single adults of any age. Quest Small Groups is part of the O.C. Singles for Christ Church. 1. To grow in your personal relationship with Jesus Christ by keeping a regular time alone with Him in prayer and Bible study. 2. To grow in community by participating in corporate worship. 3. To attend each meeting of Small Groups and be an active participant who loves, prays for and encourages those in your small group. 4. To complete the assigned homework and to discuss with others in your group what the Lord is teaching you. 5. To maintain confidentiality between the members of your small group and to foster an environment of trust, accountability and safety. 6. To pursue a lifestyle of holiness as the Holy Spirit brings to light the areas of your life He wishes to transform and bring into conformity with His will. Quest Small Group studies require 15-20 minutes per day for your devotion/study/prayer time plus the regular meetings with your group. 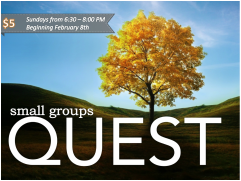 Come join us for our Small Groups Ministry called Quest Small Groups! If you’re not in a Small Group you really need to be! 1. Signups are on FRIDAY NIGHTs at 9:30pm at the info Table at our Friday Night Gathering! Or just show up! At 5:45pm on Sunday! 2. Topic: "Heaven" A DVD/discussion bible curriculum. Originally produced by Best Selling Author Randy Alcorn. 3. Cost is FREE! Or $5.00 donation for syllabus. 4. Our Groups are Co-ed. Koinonia Night, means Fellowship Potluck Mixer before the Bible Study. Details on what to bring with be emailed to participants as the particular date(s) draw near.